If you were ever in any doubt about which were the most important target markets for the upcoming Nissan Leaf electric car, here’s a simple list. The three most important markets are the US of A, America, and the United States. How else to explain a pricing strategy that makes the car more expensive in Europe after government subsidies than the US version is before tax rebates. Nissan today announced the UK price as £28,250 before sweeteners, or £23,250 after. The US price is $32,780, or a little under £22,200 at current exchange rates. The $7,500 federal tax rebate brings the US total down to within coughing distance of £17,000. We asked Nissan’s European sales and marketing big cheese Simon Thomas to explain the £6,000 difference between US and UK list prices. Give him his due, Thomas didn’t look shifty or evasive as he referred vaguely to differences in tax and specifications that mean “there is only a few hundred dollars in it” in real terms. As excuses go, we feel this is on a par with arguments about overdue homework and canine appetites. The truth must surely be that the Leaf is cheaper in the US because that’s the way Nissan needs it to be. The US market is price sensitive and Nissan evidently needs the car to be a resounding success there. Nissan says the Leaf will turn a profit within a year or so, so we must assume that European and Japanese sales will need to bankroll loss-making sales across the Pond. According to Nissan, the Leaf’s battery alone costs $10,000 (£6,800) to make, so it was probably fanciful to ever expect the whole car to compete with well-specced C-segment rivals in the £17,000 to £19,000 bracket (even if that is exactly what Nissan senior spokespeople have been hinting at for a year). Pitching it above the Prius is picking a different battle. 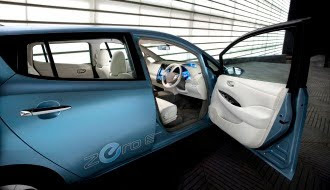 As with the even pricier Mitsubishi i-Miev, the most likely takers of the Leaf at its current tariff are corporate customers, who can effectively buy the car for less than zero once all the tax rebates are lapped up. It will be interesting to see what Nissan does with deliveries. For the first year or so, demand for the Leaf looks set to comfortably outstrip supply. How Nissan decides to juggle the 12,000 units it can deliver between now and next spring, across eager customers in Europe, the US and Japan, will be the clearest measure of its intent in those markets. Will it go for volume and the appearance of success in the important US market, keep its home market happy, or take the money while it’s sitting on the table here in Europe?